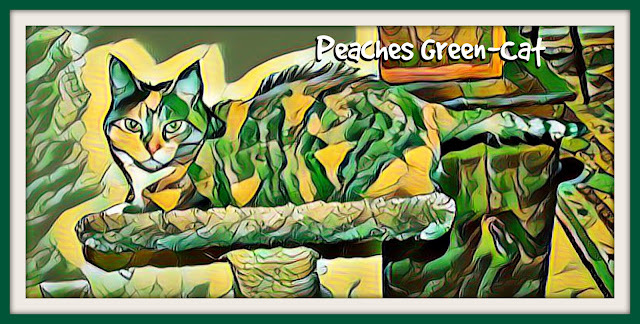 Peaches: My human insisted I become GREEN today in honor of St Patrick's upcoming day AND Caturday ART. She used the "greenify" filter from Painnt she said to tell you. What a nerve! Check out how my back hairs are standing up. do I look PLEASED? Paprika: I, Paprika, would never dream of looking as fierce as my displeased sisfur Peaches. 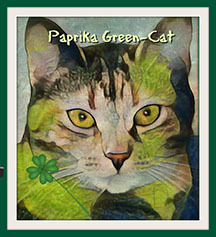 Because I was so well behaved my human gave me a green clover for this picture, also done with the Painnt Software. As you see I am a serious and well-behaved individual! It will not surprise you to know we're joining Athena & Marie's Caturday Art hop today. Happy Caturday to all! Are you serving green beer? Wow! You guys look great in green! My mum is Iriish? And she's all about the green. She bought us green hats to wear but we don't like them so much. You both look good in the green. You look darling in green!!! You look displeased. dunno why cos it looks like green is your color. So much green fun and your header is marvelous!! We hope our human remembers to post something for the day... Purrs from the Zee/Zoey gang! How GREEN you are this day. Nice.